We built our family through adoption, when we brought our son and daughter home from Russia in 1999. They were both 14 months, two days between their birthdays! Our daughter is neurotypical and our son was diagnosed with FAS when he was 4 years and 4 months. At 19, they are each thriving in their new adult lives. Our daughter will be a sophomore in college and our son will participate in a transition program that provides life skills and job skills. 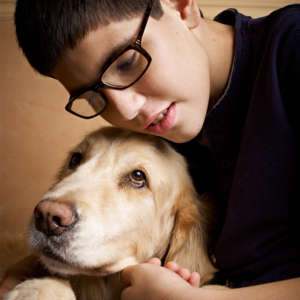 We have provided our son with different interventions and medications over the years. Some worked, others didn’t. 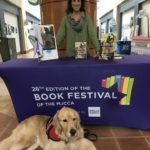 When we obtained our service dog, trained as an FASD Assistance Dog, doors opened for our son and windows of understanding opened for the rest of our family. 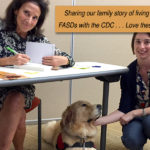 All of our family members have become educated advocates for those living with FASD. 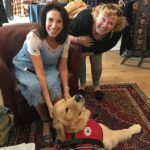 I speak and train people who want to know more about developmental disabilities, FASD, brain health and service dogs. 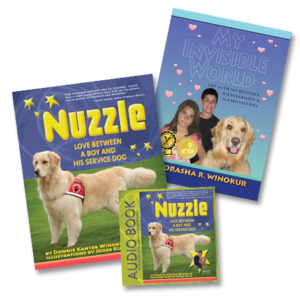 Our book writing advocacy began when our daughter wrote a book when she was 11 about being the sibling of a brother who has FAS and a service dog, and then I wrote a children’s book to help children understand FASD in a sensitive and safe way. 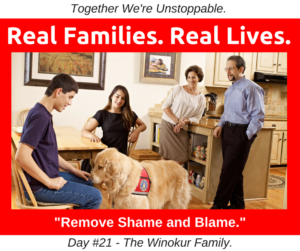 Allowing our family to become more public and vulnerable so that people have a better understanding of what thousands of individuals and families around the world face each day when they are challenged by this 100% preventable and often invisible disability. We wish that our family grows through our understanding of FASD so we can better help our son. And I wish that our outreach to those who are touched by FASDs can make a difference. We believe it’s important to remove the shame and blame that is attached to FASDs so that people can be educated. Without prevention, knowledge and compassion – our communities can’t become the healthy villages we all need. 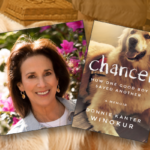 and Nuzzle – Love Between a Boy and His Service Dog by Donnie Kanter Winokur (book and audio book) wouldn’t have happened without Jodee Kulp! She helped to design, write and edit and create awesome graphics for both of our books. Then she published them through her social initiative micro-company, Better Endings – New Beginnings. 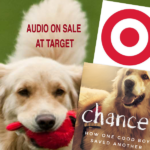 Now she is helping to develop a PR campaign for our new book, Chancer – How One Good Boy Saved Another which will be published by Grand Harbor Press on August 22nd while designing and managing the Real Families Real Lives campaign. Thank you.